✰✰✰ <level 3> In the previous chapter, the Cognition-Energy-Learnin­g model (CEL) was discussed and emphasis was placed on the energy-based process of learning. Subsequently it was indicated how the learning process could progress and what the implications of the learning process are for cognitive develop­ment. With respect to this development, the Cog­nition-Energy-Learning model, as is discussed up to now, has traced the origin of the differences between positive COEX systems (pleasant, agree­able, easy, boring, etc) and negative COEX systems (di­fficult, unpleasant, dangerous, etc). The model allows predictions to be made about the dynamics of the (cognitive) processes which control the attribution of labels to objects and experiences; it speci­fies when the "positive" and when the "negative" labels are applicable; and it describes how the dynamics of the learning process may effectuate gradual changes in the cognitive representation of objects and situations and in what set of cir­cumstances this may occur. A completely different aspect is the relationship bet­ween social interaction patterns and the learning process. The CEL-model also allows predictions about these interac­tions. However, the theoretical model, as discussed up to now, must be expanded considerably, in order to be able to describe this interacti­on. This is possible by inserting Apter's (1988) concept of reversals between transactional emotions into the CEL-model. prior to explaining the concept "transactional emotions", we shall attempt to provide an ethological foundation to the concept of "social inter­actions". In other words: a model is sought which can explain social interactions from an evolutionary point of view. In order to discover such an ethological explana­tion, we assume that social behaviour always contains a certain measure of altruistic behaviour. Hence, if a group wants to be able to work together efficiently, the indi­vidual members of the group will every now and then have to embark on investing time and energy which initially will be at the expense of themselves. This investment will however yield positive long term benefits. ✰✰✰ <level 3> Superficially looking, pro-social behaviour would appear to be an anomaly from an evolutionary perspective, evolutionary forces rather favouring "egoistic" behaviours. Evolution would favour behaviours that help the individu­al at the expense of others. Moreover, we may presume that in the environment, at least in most cases, there is only room for a limited number of individuals or of species. In other words, there only is room for a limited number of genes which compete for the chromosomal space (Barash 1986, Dawkins 1976). If an individual is to contri­bute to its own reproductive success, it should possess certain characte­ristics that are not only personally advantageous, but also actively obstruct the reproductive success of others. In great contrast to this reasoning stands the fact that many species (amongst others, human beings) are social and often even actively work together. For example, bees make very laborious hives housing thousands of bees; buffaloes live (used to live) in gigantic herds and baboons live in a complex social system and survival depends on being a member of the group. Evidently, social behaviour is not so much an anomaly as it would seem to be at first sight. Every individual within a cert­ain (socially living) group is better able to maintain itself when belonging to a group, than when it leads a solita­rily existence. Advantages of groups could for instance be: more effective defence against preda­tors, such as in the case of baboons which, as a group, can even badly maul a leopard; or a more effective alert-system, such as with the tamarinds (New World monkeys) "using" each other's eyes, noses, and ears to promote their own safety. Another advantage could be that juvenile animals are able to learn from, abundantly available, adult animals. Humans are a good example of this principle and cul­tural theories of evolution are based on this ad­vantage (e.g. Boyd and Richerson, 1985). In short, there are many advantages in working together, and in living socially. It is interesting to con­sider human situations in which one person helps the other, even if this does not benefit him at all at that very moment in terms of survival (or reproductive suc­cess, see Daily and Wilson, 1983). This type of behaviour is called pro-social or altruistic behaviour. In order to be able to explain how such behaviour was able to evolve, three different theories have been sugge­sted, having as central concepts: group selection, kin selection and reciprocal altruism respectively. The theory of group selection implies that the group (of animals) is seen as the unit upon which selection pressure operates. So the individual members of the group manifest certain types of behaviour, because such behaviour supports the group. This approach was suggested by various authors (a.o. Wynne-Edwards, 1962), but according to many it was convincingly contradicted by Lack (1966) and later by Williams (1966) (see Daily and Wilson, 1983 or Campbell, 1972) and will not be further discussed here. Kin selection was introduced by Hamilton (1964) and implies that a person's altruistic act, even if this person more or less sacrifices himself, contributes to the survival of relatives (for instance family), so that this person contributes to the reproductive success of each (altruistic) gene which is shared with this relative. According to Hamilton a condition for this model is that the groups to which human beings must have belonged, must have been small. At any rate, small enough for there to be a reason­able chance that somebody actually helps a rela­tive, carrying his own genes, with an altruistic act. "Let us take a relatively small group of people. In this group, there are, say, five hunters from each of the five unrelated families in the group. Let us imagine that the main food source consists of dodo birds and that the average probability of a hunter catching a dodo bird is low, so that he catches a dodo only once every five days. Let us also suppose that an average dodo bird will last a family for five days but really only lasts at most two days because of spoilage. Let us also suppose that a single dodo will suffice all five families for one day and that the total probability of any hunter's catching a dodo every day is unity. Than it would appear that those genetic variants that have a predisposition to share food will be more fit than those that hoard food. The sharing individual's reproductive potential will increase, and this altruistic quality will be selected for." (Shapiro, 1974, pp. 7-8). Trivers mentions a number of conditions which must be fulfilled for the evolution of reciprocal altruism. These are: (a) a large number of situations in which altruistic behaviour can occur, (b) a large number of interactions between members of a relatively small group, and (c) a division of symmetric situations in which the roles of altruist and receiver constantly interchange (for instan­ce through role specialism). In addition Trivers (1971) mentions a number of conditions such as: a relati­vely long life; the ability to recognize the other members of the group; a localized existence and a high degree of mutual dependence (for instance being endangered by the same predators or suffering food-shortage). This then results in small groups with stable numbers and little hierarchical organization in which the members provide mutually in fights with other groups. These conditions appear to be exactly the conditions which existed in the middle of the Pleistocene (ca 600.000 to 200.000 years ago), in the time that co-operative hunting behaviour in "humans" appears to have developed (Mazak, 1980). Before we go deeper into the consequences of Trivers's conditions, two postulates have to be discus­sed that will clear the way for the formulation of a system which can mediate and regulate social behavi­our. ✰✰✰ <level 3> The first postulate is that social behaviour is regulated in such a way that social interacti­ons with others proceed optimally. And the second postulate is that such a system must allocate energy resources in the most efficient way. Both postulates can be linked together in one sentence: there must be a system, or rather a capacity, for the regulation of social interac­tions, in an energy efficient way. The question now is how such a system can regulate behaviour. One idea could be that the regulation of social behaviour proceeds in a way comparable to the regulation of learning behaviour. In the previous chapter it became clear that the learning system is regulated by emotional processes. In other words, the energy surplus together with the environmental demands result in a certain reaction, an emotion, and this indi­cates the direction of the motivation. For instance: if there is an energy-deficit and the environmental demands lead to a high level of arousal, the reaction is fear or nervous tension (Apter calls this anxiety). And this reaction is experienced as unpleasant. The organism then will seek to control the situation and this is more likely to lead to constrictive behaviour than to expansive behaviour. A similar regulation by means of emotional processes may also be expected in the case of social behaviour. ✰✰✰ <level 3> A prediction concerning the repercussions of a system of motivation, that could be made on the basis of Trivers's conditions (1971) and the terms of both postulates, could be described as follows: it is a system which functions by the frequent exchange of social lending means. A person will invest in others when there is a surplus of social means and will try to withdraw that investment when there is a shortage of social means. This implies that (just as with learning) we should be able to find two antagonist and alternating states of prefe­rence. The reversal theory (e.g. Apter, 1988) does indeed claim that two states of preference can be found. Apter distinguishes two categories of emotions: soma­tic and transactional emotions. Somatic emotions are the emotions which were discussed in chapter 1 (fear, excite­ment, bore­dom, and relaxation). Transactional emotions are emotions whose origins stem and have refe­rence to association with others (Apter, 1988, p. 45). Examples of such emotions that Apter mentions are: guilt, modesty, shame, pride and spite. This concept of transactional emotions seems especially suitable to serve as a further specification of the sought after system which regu­lates social behaviour. With somatic emotions the level of arousal is the key variable and with transactional emotions the key varia­bles is: the feeling that somebody has about the outcome of a certain transaction between himself and the other (this variable is called from now on: the result of the transac­tion). What do the various terms in this statement mean? In principle, "the other" not only refers to a person, but also to, for example, a group of people, an object or a situation (Apter, 1988). In this chapter it usually is assumed that the "other" refers to a person, because espe­cially face to face contacts will be discus­sed here. The outcome of an interaction has to do with for instance the experience of winning or loosing, succeeding or failing, doing something right or wrong, and domi­nating or being domina­ted. Such an outcome is expressed on a sliding scale ranging from great loss to great profit. Just as with somatic emotions it is impor­tant to realize that with transactional emotions the key variable, the outcome of an interaction, is also a subjective variable. This means that it cannot objectively be established whether there was profit or loss, but that the person feels himself more or less well off. And this feeling about the transactional result may change suddenly (reversal). Just as with somatic emotions, there are the "telic" and "para­telic" metamotivational states, with transactional emotions there are the "autocentric" and "allocentric" states. In the autocentric mode of behaviour the (subjective) reward for the person himself is the most important determinant of the hedonic tone (how good or bad a persons feels), whereas in the allocentric state the person iden­tifies himself with the other and then the benefit for the other determines his own hedonic tone. This means that in that state - "spending part of the sur­plus of social energy or social means" - is activated because the other is the most important determinant for the hedonic tone. It also holds the other way around: when the person himself is the most important determinant for the hedonic tone, it is pleasant to reap social means. So the motivation for an allo- or autocentric state receives its direction from how the person is focused at that moment in time, either on the other or on himself. Apter not only describes the metamoti­vational states, he also names the specific emotions belonging to a certain motivational state as well as the result of the interaction. Table 2.1 shows the somatic and transactional emotions. The arrows ( ****??? ****) indicate the emotional state which is prefered in the relevant metamotivational state. Table 2.2 provides an example of the types of beha­viour that are felt as pleasant in the allo- or autocentric state respectively. This table presents the nature or character of the social means. They can be material as well as imma­terial. Now we can revert back to the stipulations mentioned by Tri­vers. The model as described by Apter (1988) must, if it also purports to describe the altruistic side of social beha­viour, among other things also fulfill the conditions enumerated by Trivers (1971) mentions. The first condition was: a large number of situations in which pro-social behaviour can occur (a). This condition certainly is fulfilled. The second, a large number of interactions (b), is also met and the division of symmetric situations (c) is also fulfilled as both parties have in principle the same social means at their disposal. The condition concerning small groups is not met, and nor, for instance, is the condition concerning weak hierarchical structures, but these conditions do not refer to the character of the social means. They refer to the question how pro-social beha­viour has been able to evolve. Reversal Theory therefore meets the con­ditions that Trivers stipulates as far as the character of the social means of exchange is concerned. One gap in the Reversal Theory is however, that it does not specify what exactly is exchanged. 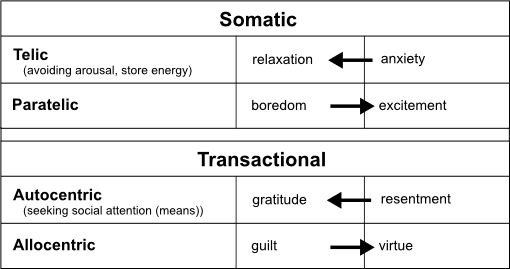 Table 2.1: Somatic and transactional emotions. ✰✰✰ <level 3> In the last paragraph, part of Apter's Reversal theory (1982, 1988) was described. Note here that the concept "social means" as the basis of the two metamo­tiva­tional states, does not stem from Apter. Apter deals with transactional emotions on a descriptive, phenomen­ological level and does not attempt to explain their dynamics. The CEL-model postulates, following Van der Molen (1983, 1984, 1985), that the energy management is the source and reason for the bistability of motivation. Table 2.2: Examples of situations in which auto- or allocentric metamotivational states occur. The result of this was that, Apter's motivational model could be extended into a model which in particular describes the lear­ning of coping skills and the cognitive representation thereof. A similar concept was also postulated in the case of transactio­nal emotions. That which determines the dynamics of transactional emotions, could be called social means, or social atten­tion. This concept of social attention can be compared to what Berne calls a "stroke" (1976). Berne describes a stroke as being a unit of recognition, and states furthermore: "... a stroke may be used as the fundamental unit of social action." (Berne, 1976). "The stroke optimum continually changes, as a result of different experiences, situations, personal developmental tasks, and it is quite likely to be influenced by biochemical processes which can sometimes cause a comfort or discomfort not easily accounted for by psychological factors alone." The CEL-model, as described above, explicitly states that tran­sactional emotions, are also not homeostatically organized, i.e. a prefered stroke-position may change radically, due to sudden reversals. Just as the telic and paratelic experience of arousal differs under the influence of changes in the energy-balance-maintenance so could the allo- or autocentric experience of the result of a trans­action differ under influence of the stroke-balance-maintenance. So when there is a surplus of social means (allo­centric), the individual distributes strokes (allocentric) and when there is a deficit or social exhaustion, the individual strives to receive strokes (autocentric). By adding to Reversal Theory the concept of distributing versus gathering social means (strokes), the key variable of transactional emotion (the subjective experience of the result of a transaction) will acquire more substance. What happens is, that in the allocentric state the person has a surplus of social means to give to another person (wants to distribute strokes). And in the autocentric state the person demands attention from another person (wants to receive strokes). Both states alternate and reverse into one another under the influen­ce of either the surplus or the shortage of social means. We can now further elaborate on the (causal) connection between telic and paratelic states on the one hand and allo- and autocentric states on the other. Imagine that the energy surplus is depleted and the person switches to the telic state (focussed on behavioural constriction). As there is a deficit of energy it is to be expected that this person is more likely to ask for help or attention than to give help or attention to others. This means that the person who is in the telic state also has a fair chance of being in the autocentric state. This does not imply that a telic state always coincides with an autocentric state and that a paratelic state always coincides with an allocentric state, but rather that the likelihood of the above mentioned relationship combinations is higher than of other combinations. Another reason for the described stochastic relati­onships might be that the reception of attention can pro­vide a certain reassurance which was sought in the telic state. From research by Bowlby (1977) it appeared that regu­lar periods of relaxation are crucial for the readiness and ability to explore new situations. He describes how a child who is exploring an unknown situation, regularly returns to a familiar person (with Bowlby: the mother). In that way the child can relax and build up energy for the next phase of exploration. All kinds of behavioural deficiencies, such as chronic fear, can arise when the periodical need for relaxation and reassurance cannot be satisfied. Since the child every now and again returns to mother (receive attention and reassurance), it can explore again (exert energy) afterwards. Attaining relaxation which was earlier defined as somatic, is thus facili­tated by the supportive attention of others. The reassurance which results from a supportive social contact, may contribute to another interesting consequence. Namely, it provides the possibility of synergetic effects. ✰✰✰ <level 3> Murgatroyd (1985) describes how the tension (level of arousal) and with that the hedonic tone - with somatic emotions - can be increased, when a person who is in the paratelic state, applies behaviour and routines from the telic state. For this he uses the term synergy from system theory. Synergy means that two processes interact in such a way that the combined effects exceed the sum of their individual effects (Murga­troyd, 1985, p. 13). Routines from the one state (telic) are then applied within the other state (paratelic) in order to increase the ef­fect. To put it more simply, it comes down to the principle that two and two make five (Postle, 1989). A synergy can occur when two different perspectives or levels of meaning of the same entity or event occur immediately after each other or simultaneously, while these perspectives are in principle mutually exclusive or are each other's opposite. A sport such as badminton may serve as an example. A feeling of security and safety is obtained by the "context" of the game: the hall, the net, the lines, the player's positions on the court etc., together with a series of strict rules of the game and the referee who enforces the rules. Within this fixed context which is predictable and safe, the badminton-players play the game. The game itself can be called the "content" of the situation which always differs, always produces unexpected incidents of which the outcome is uncertain as well as the way in which they occur. The opposing characteristics in this example are (1) the safety and security provided by the context of the game and (2) the tension and arousal, produced by the content. In such a situation (context is safe, content is uncertain) the context must provide the security or relaxation which will induce the paratelic state and the content provides the extra tension which is pleasant in the paratelic state. The synergetic effect that is caused by the excitement of the game and the security of the context, raises the arousal and provides a pleasant situation (in the parate­lic state). In the telic state this extra tension is felt as extra unpleasantness. Especially in the beginning, the aspects which are certain must often have a dominating function, because otherwise a telic state would be induced and the arousal would be experienced as unpleasantly threatening (Apter, 1982). Synergy can also be observed in transactional emotions. By using routines from, for instance, the auto­centric state within the allocentric state, the emotional "profit" for both parties can be increased. In other words: by receiving strokes every now and then in an allocentric state in which it is basically pleasant to distribute strokes, part of the positive meaning of receiving stro­kes in the autocen­tric state can "penetrate" into and merge with the pleasant feeling of distributing strokes in the allocen­tric state. Seeing that the allocentric state domi­nates, the autocentric subrou­tines can be regulated and controlled more safely and easily. One can, as it were, choose the meta­motivational state with the mat­ching emotions and emotio­nal value (hedonic tone) and adjust better to the requirements of the moment. The effect of this is that both the gratitude (for benefitting from the interaction) and the feeling of virtue (for doing much for the other) will occur more often. Thus the emotions with a low hedonic-tone (e.g. the feeling of guilt or rancour) will occur less frequently. "Gratitude" and "virtue", occurring next to each other (and mixed with each other), thus strengthen both types of pleasant feelings (= synergy). This synergy in which opposite ways of experiencing social relationships occur together, differs in an important respect from the telic and paratelic synergies as discussed above. There is more than one person involved. Synergy in trans­actional emotions implies the interests of another person. By enlarging the reciprocity of the interaction, the net benefit can become more attractive for both par­ties. Transactional synergies also occur regularly in interac­tions in which there are two opposite levels of meaning: on the one hand a (social) context which provides security, familiarity and predictability and on the other hand the content of the social contact which provides tension and has the effect of raising arousal. The context must offer a sense of security and familiarity, so that a paratelic state is facilitated. The content of the contact then may induce arousal and excitement and this will be the case with events that are related to negative COEX systems (for instance: talking about your own fears and intimate prob­lems). The exciting areas (in a paratelic state) are namely exactly those areas where there is still a great deal to be learned (negative COEX systems). In summary: by the simultaneous occurrence of the restful, certain context with the exciting, thrilling content of the social contact, a synergic effect is brought about which is experienced as extremely pleasant in the paratelic state. It is important that initially the safety of the context is prominent for otherwise a telic state would be facilitated and the arousal would be experienced as threatening. When the con­text is safe enough, the excitement of the content may be evoked by matters which are related to negative COEX systems. Synergy which is based on the reciprocity of the social interaction, can influence the relationship in two ways. In the first place, it can increase arousal for the content of the contact at the moment synergies occur. So on the proximal level (at the moment that synergies occur) the contact can be extra exciting. In the second place, having a reciprocal relationship can lead ultima­tely to a feeling of ease, relaxation and rest in combination, and thus lead to a restful context. And this context in itself forms the basis for more synergies. One implication of the above for clinical practice must now be obvious. A client in a low energy state will often be in an autocentric state and hence be economical with the social attention he or she pays. But it is exactly this economizing that diminishes the benefits of the client's social interactions, for instance because no synergies can arise. The responsibility of the therapist must then be to create such a climate that (1) the client is offered the possibility to settle down in the relations­hip with the therapist and (2) the client is encoura­ged to gradually invest a little more social attention, so that a reciprocal interaction will become possible again. In this way the client will also be offered the opportunity to accumulate ener­gy. In the literature on synergetic effects and on how relationships might develop in the optimum case, a number of conditions are mentioned for the establishment of such a relationship. ✰✰✰ <level 3> Various authors put forward a number of different conditions for "good" relationships. Three such authors will be discussed in order to illustrate the predictions the CEL-model makes and to show how the mentioned conditions match the theory. Postle (1988, in his publication on: "...the results of enquiries into how synergy, high energy creative col­laboration, can best be promoted...", arrives at a number of interpersonal skills required for syner­getic effects. He distinguishes two types of interpersonal skills. Interpersonal skills can be focussed on (1) being able to communicate clearly and make choi­ces, and on (2) regulating emotions and fee­lings. When, in the groups Postle was working with, no attention was paid to the second type of interpersonal skills, behaviours recurred which resulted in pola­rization on the division of the group into parties and also led to sudden changes in moods and feelings of the members of the group. This occurred especially when the members of the group were enthusiastic and wanted to devote themselves to the purpose of the group (for in­stance, making a T.V. production). Postle then states that when members of the group are very enthusiastic and as a consequence are strongly aroused it is extremely difficult to maintain co-operati­ve behaviour. As soon as self-interest emerged, the result was that co-opera­tion suddenly ended, resulting in conflicts, argu­ments and mutual hostility. able to freely express both positive and negative feelings. able to hold on to feelings when appropriate. able to tolerate the expression of others. Rogers (i.a. 1976, Dutch edition) identifies, final­ly, three basic conditions for a certain kind of relati­onship in which the other will discover in himself the capacity to use this relationship for his own personal development. These basic conditions are: genuineness or authenticity, unconditional acceptance and empathy. The question which now arises is how this information relates to the model which has been developed here, where allo- and autocentric states and the rever­sals in between them play an important role. To recapitulate: for synergetic effects (1) the contact must be reciprocal and (2) the context of the contact must provide security whereas its content must be exciting. These conditions, and for that matter also the conditions mentioned by the other authors, should either serve the reci­procity of the contact or they should create a basis or context which offers security and safety. The reciprocity is in our view stimulated when an individual is: real; empathetic; able to express both negative and positive feelings; able to trust and persist in his/her own feelings if they are appropriate in the contact at that moment; able to tolerate other people's means of expression and not only to tolerate, but also to cherish them. Being real and empathical has the important effect that the strokes which are exchanged, are more "effective" (the stroke is more easily recognized and tunes in to the needs of the "receiver"). When strokes are more effective, the result is that a person more often has the feeling that he/she receives attention. And this has a posi­tive influence on the stroke-reserves. The ability to express both negative and positive feelings results in the individual into being available for the other for strokes and it becomes more clear now how this functions in the individual. In addition the strokes will then often be more effective. Being able to persist in your fee­lings when they are valid and approprate to the situation, means that one provides clarity about oneself while at the same time standing up for one's own feelings, so that the other can, in turn react appropriately. Cherishing individual differen­ces has the effect that the difference between the individuals is not considered to be distur­bing but rather as inspiring for further contact. The above mentioned conditions render the contact generally more exciting and are thus pleasant when both persons are in a paratelic state. These conditions which the individual needs to fulfill in order to build up reciprocal contact, can also be seen to define the context. The other conditions mentioned in our view also promote the establishment of a safe context. The conditions Postle fur­ther mentions highlight the nuances in a person's behaviour, so that it can better be applied in the right place and can be expe­rienced as less problematic and threatening. All in all most conditions seem to influence the experienced safety of the context. This is, regarding the energy dependent basis of development, in our view no surprising result. The context of the contact obviously influences the degree to which and the ease with which a person can settle down (see Bowlby's research, 1977, p. 41). This implies that social contacts influence the learning spirals as described in chapter 1. ✰✰✰ <level 3> The facilitating effect of "good" social relationships on development lies, according to the CEL-model, especially in the security and the relaxation the contact offers. When suffi­cient security and safety originate from such a context, the content of the social interaction can be more exciting and envigorating. The security of the context results in a stronger sense of control. Having the sense that one can control the situation well means that (provi­ded that this really is the case) the individual can more often easily relax at the moment he or she is in a telic state. Moreover, the very feeling of having the situation under con­trol implies safety and hence diminishes arousal. Being able to settle down more often has the effect that the the individual more often has the opportunity to replenish the energy resources and to process and "digest" the expe­riences. Replenishing the energy supply means that the individual will be in the paratelic state more often and will build up, in an explorative way, an surplus of experience. Such a surplus results "automa­tically" in neces­sity-orientated behavioural strategies (see chapter 1) and hence in a more efficient and economical represen­tation of reality. This means, in turn, that an individual will be better able to organize his social contacts in such a way that they regularly produce security, re-assurance, relaxation, etc. The reverse may, however, also be true. A social contact can also have a stagnating influence on the individual learning process. What tends to have gone wrong concerns, in principle, the security a contact can offer. This may for in­stance occur when both parties feel that they are not understood by the other (for example, because, the conditions of authenticity and empathy are not fulfilled). Rogers (1976, p. 265) mentions that the greater the extent of communicated incongruity, the more the relationship which emerges will contain the following elements: further communication with the same qualities; less accurate understanding, decreasing psychological "adjustment", and therefore more defensive behaviour and rigidity, worse functioning on both sides; and finally mutual disappointment in the relationship. Or in terms of the CEL-model: the context of the relationship offers too little security so that the likelihood that a parate­lic state is induced, diminishes. Moreover, the reciprocity of the contact is not initiated. The contact easily results in tension and because the context offers too little security, the person normally is not in a paratelic state and the tension will be experienced as unplea­sant. Being more often tense in a telic state means that one can less often relax when this is needed. And less relaxation often implies that there will be a diminished supply of energy. Less energy results in more frequent telic behaviour, and moreover, the tension of the contact will more often be experienced as unpleasant. Less energy also results in less paratelic states and so less explora­tion will be undertaken in exciting and new situations and attention will be paid to others less often. In this way, no surplus of (social) experience sur­plus will accumulate and the person will continue to use sufficiency-orientated recipes. The person has an inaccurate and ineffi­cient represen­tation of the relevant surroundings and the behavioural reper­toire shows deficiencies accordingly (see also chapter 1). Such a clear-cut "one-way traffic" in the direction of a good or a bad development will mostly be more ambiguous, as in the meantime other relationships and other situations can also assert their in­fluence. Still, it is good to realize that in a short period of time an individu­al can, in spite of, or better still despite his or her social contacts, end up in a negative learning spiral. This seems to be specifically relevant when a person needs extra time to process a life-event (for in­stance, the loss of a partner). Rogers mentions in the work quoted above yet another important aspect of relationships, namely that both parties in a relationship start to function less well because of what he calls communicated incongruity. He means that the par­ties in a relationship influence each others psycholo­gical "adaptation". ✰✰✰ <level 3> As in the paragraph on the conditions for syner­getic effects, we will first mention a number of examples from the literature and then discuss these from the point of view of the CEL-model. The examples also serve to illustrate the concept of contagiousness of psychologi­cal adaptation, and are not intended as an exhaustive list or as profound analysis. Hoevenaars and Van Son (1989, p.108) state that with the exception of marriage conflicts, all connections between assumed causal factors (life-events, stress, social support and expressed emotion) and depression can be reduced to epiphenomenal relationships. Why conflicts in marriage-relationships are a prediction of depression is unknown. Considered from the CEL-model, such a connection between laborious relationships and other problems relating to psychological adaptation is obvious. The marriage partners, whose relationship is not sufficiently reciprocal and offers too little relaxation, disturb each other's optimum motivational sequence and this easily results in a reduced psychological adap­tation in the broad sense and a chronically reduced sense of well-being (for example in depression). Another example of contagiousness is the case of a so-called "folie a deux", where psychotic symptoms (usually delusions) are passed on from a psychotic person to a "healthy" person (Freedman et al., 1975). It even happens that several persons are involved in an induced psychosis. Goduco-Agalar and Wintrob (1964) mention a `folie à famille'. The eldest daughter "infected" the entire fami­ly, with the result that they, all seven together, beat an aunt to death in a state of religious frenzy. This contagiousness of psychotic symptoms only occurs in exceptional circumstances in which (a) the psychotic person is dominant and (b) the persons interact very closely with each other for a long period of time, relatively isolated from others. Even then the delusions remained within the limits of what is possible and they were based on events from the past or on similar expectations (Lase­que and Falret, 1877, in Freeman et al., 1975). In the case of a folie a deux two separate, but related things happen. The people concerned not only influence each other's psychologi­cal adaptation, but the cognitive contents also turn out to be contagious. This contagiousness of cognitive contents will not be further discussed here. Both examples originate from the realm of psychiatric aid and serve here to illustrate the concept contagiousness of psycho­logical "adaptations". They are clear because they both had a pronounced effect. Nonetheless, in our view, it is suf­ficient to study one's own relationships in order to recognize the contagiousness of moods and emotions in particular. But also the feeling of loosing energy in certain contacts is for most people a not un­familiar phenomenon. Such phenomena occur according to the CEL-model in particular (we repeat) when the contact is characterized by misunderstanding (strokes are not effec­tive) and tension, while both are in a telic state. For example, when one party constantly tries to demand attention and the other constantly has to give. Especially when both persons are in an autocentric state, they will not be able to relate. "In daily work interactions, human service professionals often encounter situations that are emotionally arousing, frustrating, and perhaps personally threatening. In response to these intense experiences some people begin to take a very cynical, derogatory view of the people they are hired to help. (...) They begin to experience physical symptoms, increased use of drugs, marital conflict, and needs for solitude or detachment from all social contacts. (...) In this and other examples of stagnation, the person loses sight of the potential for nurturing, education or guiding others and becomes trapped in the struggle to protect the self." "Getting deeply and emotionally involved in other people's severe psychological problems and emotional disturbances - one of the prerequisites for therapeutic success -, takes an awful lot of emotional energy, warranting quite frequent periods of emotional recovery in order to maintain a proper motivational balance ...."
Especially these necessary periods of rest are frequently curtailed because of the average number of clients a therapist is supposed to see each day. Interpersonal contagiousness of psychological adapta­tion cannot only be explained from the CEL-model, but is even specifically predicted. Other predictions of the CEL-model con­cern the learning spirals as described in the previous paragraph and the possibility of synergies. The most obvious next step in our view is to check what can be found in the literature in the field of social contacts and the influences thereof on the learning process. In other words, to check whether the predic­tions which can be sifted from the CEL-model can indeed be traced in the research literature. To that end the research on social support seems most relevant. ✰✰✰ <level 3> What predictions can be derived from the CEL-model in relation to social support? Owing to the influence of social contacts on the learning process in both a facilita­ting, positive direction as well as in a stagnating, negative direction, it may be expected that both outcomes indeed can be found in the results of the research in the field of social support. In order to check this, first and foremost a distinction should be made between the direct effects and the buffer effects of social support (Thoits, 1985; Cohen and Wills, 1985; Marcelissen, 1987; Buunk, 1988). Such a distinction must be made because this is also done in the literature on social support and because such a distinction can also be traced in the research data. Buffering effects occur when the social support reduces the negative psycho­logical effects of unpleasant events and/or chronical difficulties in a person's life, whereas this support does not influence psychological symptoms when there are no stress­ful circumstances (Cassel, 1976; Cobb, 1976; Kaplan et al., 1977; see Turner, 1983, for a survey of the research on buffering effects). Others (for in­stance Thoits, 1982, 1983) maintain that the changes themselves in social support already function as stressors. These changes are called direct effects of support. Finally, there are a number of studies (Dean and Ensel, 1982; Henderson et al., 1980; Husaini et al., 1982) which have found both effects (di­rect - and buffering -). In our view we can conclude from this cumulation of empirical material that both effects do indeed occur. Direct and buffer effects can mediate psychological consequences of stressful circumstances. "It is further remarkable that regular reports of negative connections between (direct effects of) social support and well-being are (...). The results in relation to the possible buffer function of social support with stress at work, are even less convincing than those in relation to the direct effects." So these predictions of the CEL-model in relation to the ef­fects of social support are also valid. For many a support scheme this is not a very en­couraging result, as an explicit attempt is made in such cases to promote social support in such a way that it facilitates development. The main reason why nega­tive effects of social support are also found is that little is known about the mechanism of supportive processes and therefore it remains unclear what precisely has to be done and when. "We currently lack an understanding of supportive processes." "Little systematic research has been done on psychological mechanisms which can explain the direct and buffer function of social support." So not only the results of the research on social support seem to support the predictions of the CEL model, but in our view this model can also contribute to the stimula­tion of systematic research on the mechanisms behind social support. The CEL model specifically allows predictions to be made concerning the question when support can be effective and when not. The CEL helps to fill in gaps in our understanding of the mechanisms and effects of social support interactions. ✰✰✰ <level 3> In this chapter, an extension was presented of the Cognition-Energy-Learning model. In order to be able to draw up a number of conditions for the evolution of social processes, we started from an ethological point of view. This enabled us to draw up a model of social interactive processes. This model i.a. implies a bistable or­ganization of social interactions. These two basic motivational states correspond with the allocentric and the autocentric state, as described by Apter. In the "allocentric" state the individual is not so much oriented towards personal social gains, but rather identifies him/herself with the other. The benefits for the other are then the primary determinant for the hedonic tone. In the "autocentric" state the reverse is true; the benefits of the interaction are experienced and appreciated as pleasant when the person himself is the receiver. The interplay between social interactions and the dynamic state of the learning process was further elucidated in the light of transactional and somatic drivers (motivations) and emotions. By including a social exchange unit (strokes) to Apter's explanation of transactional emotions and discussing the implications thereof, a number of processes were clari­fied which until now had not been explained sufficient­ly. Examples are synergetic effects, contagiousness of psychological adaptation and the processes behind social support. Synergy can facilitate the individual learning pro­cess, but this will only take place when the person involved is in a paratelic state. The influen­ce of a social contact on the learning process proceeds, according to the CEL model, mainly through the certainty, security and relaxation which the contact can or cannot provide. In other words, if a contact influences the alternation between paratelic and telic states, the contact will influence the development. This can be an influence which facilitates psychological adaptation, but it also can be an influence obstructing this adaptation. From the research literature on social support it is not clear which processes do what. The CEL model as developed here allows us to make predictions about the question when social support can be effective and when absolutely not, and thus contributes to a useful definition of social support. Contagiousness of psychological adaptation, was also discussed. Here it also holds that this contagiousness occurs because individuals can influence each other's energy state and hence each other's metamoti­vational states. In view of the conditions that a social contact must fulfill in order to facilitate develop­ment, predictions can be made about the relationship be­tween a therapist and a client. According to the CEL model the security a contact can offer is the most impor­tant predictor of success and this is also an important con­dition for a therapeutic relationship. It was argued that the content of a contact can be more exciting, also through effects of synergy, when the context of that contact also offers more security. According to the CEL model, this has consequences for the success rate in psychiatric relief work. If we may assume that talking about intimate problems contributes to pro­cessing and digesting them, a rela­tionship offering the space (in terms of energy), needed for paratelic states to emerge, will contribute to attracting relevant experiences and to the processing thereof. This happens more or less automatically because the areas of experience which were represented as exci­ting also are the areas which contribute maximally to development once they are provided with necessity-oriented cognitive representations. In terms of Vygotsky (in Parreren and Carpay, 1980) it can be said that the exciting areas are the potential areas of further development. In these areas one can learn most fruitfully. Is the context not secure and relaxing enough, the CEL model predicts that the client will prefe­r not to broach the relevant areas of experience, in conversations or otherwise, or at least will find it very difficult to do so. Another aspect of the CEL model as developed so far, is that predictions can be made about for example the attribution of emotional labels to objects, situations and experiences. In view of Czapinksi`s re­search (see chapter 1) it may be expected that the mass of experiences that are not directly interesting, will "end up" in a diffuse, slightly positive cognitive background field. Only the experiences with a pronounced emotional "colour" are pro­cessed well or represented as problematic areas of ex­perience. The advantage of such a representa­tion system is that, as soon as there is a surplus of energy, one can ex­periment in the areas which are known to be problematic areas of experiences. And these are exactly the areas that can provide the newest and most relevant information. Finally we provide a short recapitulation of all implications of the model. In the first place, the CEL model indicates how the learning process depends on a person's energy balance. Moreover, this also explains how the lear­ning process is controlled by emotions. Subsequently, from the detailed description of the learning process, predictions can be infered concerning cognitive processes. The way in which the experiences are represented (in COEX systems) as well as the gradual shifts in those representations are described. It is further clarified how a certain cognitive representation, with concomitant behaviour-procedural characteristics (neces­sity- or suf­ficiency-oriented recipes) leads to specific types of behavi­our. The CEL moreover allows detailed predictions about the possibilities of intervening in the development of a person by redirecting the basis of this development, energy management. Thus a model was developed describing how social interactions are regulated, again through the emotions. Therefore, units of social exchange were introduced, "strokes". All in all the CEL model is an attempt to integrate a number of phenomena which generally belong to distinct and more or less unrelated areas of research. The reported phenomena range from ethological and biolo­gical influences through motivation and learning processes to cognitive representations and social interactions. The research, discussed here in relation to the CEL model was collected more or less ad hoc, since little research has as yet especially been set up for testing hypotheses stemming from this model. From the previous chapter it should however be clear that the CEL model more than adequately allows substantial predictions to be made that can be tested empirically. Barash, D.P. (1986), The hare and the tortoise: culture, biology, and human nature, New York: Penguin Inc. This page was last modified on 17 January 2017, at 14:35.